Crossfields TRA needs some new members to take up the vacant posts of Chair, Secretary and Treasurer. The AGM is this Thursday evening, when new committee members can be nominated and voted in – or you can just come and meet your neighbours! The TRA provides a collective voice for improving our estate and local area. Lewisham Homes and the Lewisham Tenants Fund can provide training for residents interested in standing for committee positions if they believe they lack the skills, and the 'Pink Palace' has recently been refurbished so it's a much nicer place now for residents to meet each other. We gave a digest of the Open Floor Hearing held at Deptford Lounge on 5th February in our previous post, but some of the speakers at the hearing have since submitted written versions of their oral representations. They can be found in the "document" section of the Planning Inspectorate's website (see below for specific links). Thames Water have replied to some of the points raised at the hearing, with a characteristic dismissive air. Read their response here. Meanwhile, the Inspectorate are staging another site visit to Deptford Church Street on Thursday 27th February at midday. This is to visit St Paul's Church which they were unable to access on their last site visit on 30th January because filming was taking place. 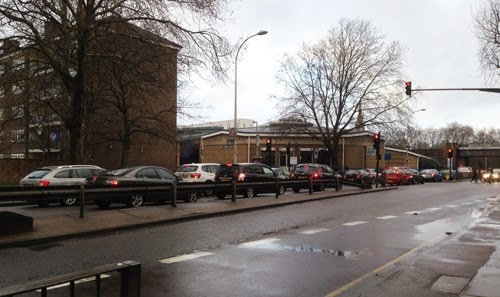 A resident's analysis of the Transport assessment can be found here, along with photos and video links of recent congestion in Deptford Church Street here. Letters of objections from Crossfields residents can be read here. Another Crossfields resident has written here. A resident living close to St Paul's writes here. 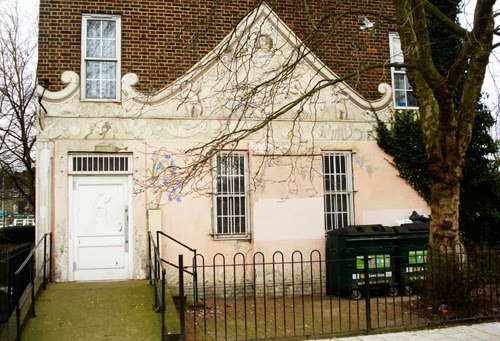 Deptford High Street Community Garden Association's comments can be read here. Dame Joan Ruddock's speech from that evening can be found here. Representations from campaigners against the entire Thames Tunnel project (who also spoke at the Deptford Lounge open floor hearing) can be found here, here and here. LB Lewisham has subsequently submitted a draft Section 106 agreement to Thames Water, but there is very little in it to mitigate the 3-4 years of noise, dust and pollution – mainly because Thames Water consider most of the construction work to be of 'negligible' consequence to local residents (see their analysis here). Regarding the roadworks Thames Water currently have in operation, it appears the Wavelengths bus stop has not been removed contrary to what some of us were told back in January. Fortunately there have been no accidents or tunnel closures during this period, so congestion has not been worse than usual. Some Crossfields residents may have also received notification that 'investigative works' will take place on Crossfields between 3rd-7th March, though footpaths will be unaffected. There were two 'Open Floor Hearings' conducted by the Planning Inspectorate about Thames Tunnel's proposed site on Deptford Church Street on Wednesday 5th Feb – one at the Ahoy Centre at 7pm and another at Deptford Lounge at 8pm. At the Ahoy Centre, the only speaker was David Gittens from Greenwich Council, who said that the Royal Borough are alarmed that the "lobbying and protest" from campaigners in Deptford had caused the Planners to re-examine and ask further questions on Borthwick Wharf (the alternative site situated on the river near the new Paynes & Borthwick Wharf residential development and Millennium Quay which was originally Thames Water's preferred first choice). The hearing at Deptford Lounge, however, was very well attended and at least 100 people turned out, with twenty registering to speak, the first of whom was Dame Joan Ruddock MP (read her speech here). You can listen to a recording of the hearing on the Planning Inspectorate's website by going to this page, typing 'Deptford' in the Filter box, clicking on 'Next' under the Filter box, then scrolling down to the microphone sign at the bottom of the page. (1hr 49mins). They don't make it easy! * If you'd prefer a quick read, see the digest under the dotted line below. Among those attending were three representatives from Thamesbank, a London-wide group made up of environment and engineering experts, who are opposing the entire concept of the tunnel. Thamesbank includes Professor Chris Binnie, who originally led the study group that recommended the tunnel solution to meet EU regulations, but who, horrified at how that proposal had turned into a capitalist "investment opportunity" that shafts the consumer, now advocates more sustainable, affordable and longer lasting alternatives that can be achieved on a local level without totally ruining everyone's lives. (download his latest paper here). Both Ms Ruddock and Lewisham Council have stated their approval of the Tideway Tunnel in general, despite objecting to the sites in Deptford (and to Greenwich Pumping station too). Perhaps they can be persuaded to change that view when presented with the facts. Not attending on Wednesday was Patricia Chantrey, the Head Teacher of St Joseph's School, but she has previously voiced her very considerable concerns at a hearing at the Ahoy Centre held on 21st November 2013. She can be heard putting her case here. She explains how the full curriculum cannot be covered by keeping the children indoors sheltering from the dust, fumes and noise; how children will not be able to play outside, how special needs children will be affected, how health & safety procedures are threatened, and how there can be very little done to mitigate the situation. Other excellent speakers on that day in November outlined exactly the same issues as were heard on Wednesday and can be heard here (1hr 34mins). As well as local residents and businesses, representatives from Lewisham Council also spoke against the proposal. See ** below for notes on that. It all makes for extremely interesting, if depressing, listening – a variety of Deptford voices desperately trying to defend our community from a corporate monster. NB: Much of the submitted evidence to the Inspectorate can be found on this page, but you really need to know what your looking for to find it! No wonder we don't know what's going on. (0:04:08) Dame Joan Ruddock MP was the first to speak and gave an eloquent outline of the issues concerning her constituents – how it would affect the school, the church, the green amenity and how the partial closure of Deptford Church Street for three years would adversely impact on the high street and residents. She set the stage for the speakers to come and was warmly applauded. She was followed by Graham Stevens (0:08:33) from Blue Green UK (and Thamesbank), speaking about the alternative technology and developing new industries that Thames Water and the government have not explored and don't want to understand. (They have spent £100m on researching the super-sewer but only around £200k researching alternatives). He claimed the Tideway Tunnel proposals amounted to fraud on a massive scale. Ray Woolford (0:13:10) from People Before Profit followed and covered all the issues well, pointing out that there has been no thorough air monitoring done in the area. (0:17:43) Harry Richardson, high street resident and one of the co-founders of Don't Dump on Deptford's Heart, spoke as Chair of Deptford High Street Community Garden Association, which he and a group of local residents have been trying to set up on the green. He announced they going to start gardening this month. 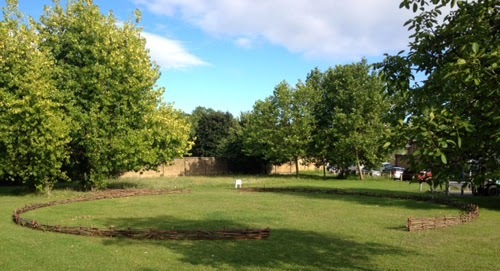 The willow circle they intend to garden in is situated next to St Joseph's School, and marks the area where TW want to build their shaft and is the same diameter (17m) that the shaft will be. Read Harry's submission here. (0:24:55) Joe Dromey and Brenda Dacre spoke on behalf of Don't Dump on Deptford's Heart. Joe said it had been a deeply flawed consultation, TW hadn't met the community since 2012, and there has never been a satisfactory explanation for why the preferred site was suddenly changed from Borthwick Wharf to Deptford Church Street. TW had identified that the Church St site was far less favourable in socio-economic, community and environmental impacts, but more favourable in engineering terms – a proxy for 'cost'. TW had chosen the site because it was already very noisy – "a moronic and perverse logic" he said. DDoDH had also conducted a Citizen Science pollution test that was concluding this week and would show pollution in the area, particularly on Deptford Church Street, was already breaking EU limits. (0:34:55) Emma Redstone from Crossfields (Castell House) spoke about the noise and pollution impacts of the partial road closure and pointed out that even with double glazing, residents overlooking Church Street could still hear the traffic. She added that TW's Traffic Assessment was out-of-date. An elderly gentleman from Poplar then questioned the rerouting of the Tunnel which he suggested avoided the Isle of Dogs (expensive property at Canary Wharf). He wanted to see more transparency in the costings. (0:43:55) Sue Lawes spoke on behalf of Crossfields Tenants & Residents Association, and expanded on Emma Redstone's previous statement with reference to TW's Transport Assessment which was based on out-of-date figures from Transport for London compiled in 2011. With confirmation from Lewisham Planners, she said that TW had not listed the new developments taking place (whose construction vehicles would be using the road), they had not accounted for how emergency vehicles would get through, and they had not analysed the most-used pedestrian crossings at Giffin Street and the Birds Nest, but only the crossing by the site. They had not looked at Creekside as a rat run congested by construction traffic because their own construction vehicles (140 per day) would not be using that road. They had not considered the full impact on residents, especially the elderly, of removing essential bus stops. Their 'traffic flow' assessments were numerically illogical, as well as out-of-date, and the number of HGVs and diesel powered vehicles had been underestimated. There had been no consultation with Crossfields Estate residents or up-to-date information provided to them (such as how concrete mixers will be allowed to operate 24/7 at the site). She concluded that TW hoped to get by on this Transport Assessment and iron out the details after they had got planning permission, but for everyone here and everyone using Deptford Church Street, that would be too late. Read her summary here. She also reported that the northbound lane of the Blackwall Tunnel had been closed that very afternoon and caused gridlock on all the roads in the area, especially Deptford Church Street. It was nothing to do with the tube strike – the DLR and Overground had been working, and although South Eastern trains were disrupted, they do not serve north/south directions – the traffic was trying to get to Rotherhithe Tunnel. She had video evidence of the resulting gridlocks and asked if it was submittable. (She was later told the Inspectorate's website cannot support video, which means the Planning Inspectors would not view them, even with links to YouTube). Other local residents spoke in support of previous statements. Vanessa MacNess from Crossfields (Farrer House) (1:09:31) lives opposite the site and was worried about the noise from the construction works – she thought the average predicted noise level of 65decibels might already be the norm – and, as an artist, she felt the beauty and culture of the site would be robbed from us. Andrew Lincoln (1:11:36) is a private resident who echoed Joan Ruddock's use of the phrase "it beggars belief" in relation to siting the shaft construction on the doorstep of a primary school, and observed that this wouldn't happen in a wealthy suburb (Joan had used the phrase to describe the lane closures). Margaret Lincoln (1:13:54) pointed out that it wasn't just primary school children who would be affected, since many local young people used the 47 bus to get to secondary school. (1:14:42) Roland Gilmore, from Thamesbank, said if the government had consulted environment experts instead of 'drainage' experts they would have come to quite different conclusions about the best solution. He spoke about misrepresentation, falsehoods, lack of meaningful consultation, lack of cost-benefit analysis of other alternatives and lack of baseline studies on noise and pollution. The public have been misinformed by Thames Water, the government (DEFRA) and the Environment Agency. He talked about moral considerations: 620,000 people are already in 'water poverty' unable to afford their water rates with 1.1m close to that margin, but TW want to raise bills by £70-£80 a year to pay for the super sewer. The costs on the health and sanity of those affected by the construction has not been considered at all. More local residents endorsed what had already been said: local resident Erica Crockwell (1:27:25) said there would be no benefits to local people, whilst local mum Samantha Hunt (1:28:31) pointed out that Borthwick Wharf was not close to a primary school or a Grade 1 Listed church, is not near a busy high street and market, nor requires the closure of a dual carriageway and is not in the middle of a green breathing space. A lot of money had been spent in building a new school and library two minutes from the site (Tidemill) as part of the regeneration of the centre of Deptford, she said, only to be ruined by this proposal. Thames Water cannot possibly mitigate or compensate our community for the damage they are proposing. (1:31:08) Rebecca McCrow, a resident from Resolution Way, representing both young and elderly flat owners and renters, said they already cannot open their windows because of noise, and pointed out that because their building was new, it was not even featured on Thames Water's original plans and therefore its residents had not been taken into consideration at all! (1:32:25) Alex Redmond, another young mum, spoke passionately about how the shortage of primary school places in the area had meant it had taken her six months to get a place for her son at St Joseph's, and now almost his entire primary school education and future were going to be ruined by the construction of a shaft right outside the school. Our area is one of the most deprived in London, and education is a key to getting out of poverty, she said, and called Thames Water a "greedy corporation". "What you're doing to our people is wrong. These children deserve better!" she concluded to loud cheers and applause. Phil Pirt (1:37:40), another resident from Resolution Studios, supported all that had been said previously, and a resident living besides St Paul's Church, Geraldine Charles (1:38:44), believes the green is previously a burial ground (there used to be rectory on this site). The final speaker was Dido Berkley from Thamesbank (1:39:27) who questioned the application's "lawfulness" (it surely must be unlawful to operate 24/7 as TW intended to do), and the 'cost benefits' versus the 'social impact' were unbalanced. Costs had already risen from £1.7b to £4.8b and were expected to rise to £6b, when cheaper, more localised, less impactful alternatives were available. She pointed out that of the 30 odd subcontractors already appointed, 24 were foreign companies, eg non-UK tax payers. Harry Richardson pointed out that a school of 400 kids in Deptford is given the same weighting as one household at Borthwick Wharf and described plans for the site by the Deptford High Street Community Garden Association. Edward Hill from Greenwich, who considers St Paul's Church part of the Greenwich World Heritage Site, argued for alternative technologies and warned that the carbon emissions from building the super-sewer had not been evaluated. The businesses on Crossfields Street were represented by Rob Wicker, and Crossfields resident Nick Williams put the case exceedingly well for the Don't Dump on Deptford's Heart campaign. Lewisham Policy Planning Officer Brian Reagan spoke in detail about the myriad potential impacts on the area, describing how it had managed to survive the last twenty years, and stated that Thames Water had refused to engage in discussions in any meaningful way. Alan Smith, Cabinet Member for Regeneration, defended Deptford's 'fragile economy'. Father Butler, rector of St Paul's, spoke on behalf of Deptford's 'voiceless', and also how the church would lose the self-generated revenue that it raises to support the upkeep of the Grade 1 Listed building. He also commented on the average level of noise expected from the development (65 decibels) which, he said, was "the same as being on an aircraft for three years". Cllr Crada Onuegbu (Evelyn Ward) pleaded for Thames Water "not to take away what we've taken so long to build". Kevin Reid, Senior Stategist at the GLA then stated that the Mayor of London supports the Tideway Tunnel in principle, and approves the selection of Deptford Church Street. Booo!!!! With that sort of endorsement, it was easy for Phil Stride from Thames Water to end that morning's session with the assumption that the plans will go ahead and all that needs discussing now is mitigation and compensation. The Planning Inspectorate – who are making the decision on the Thames Tunnel – will be holding a public hearing tonight (5th February) from 8pm in the Deptford Lounge. The hearing is one of the final opportunities for local people to speak out against Thames Water’s plans that will have a serious impact on our community. There will be a friendly demonstration from 7:30pm outside the entrance of the Deptford Lounge. Please come and join in if you can. And then come into the hearing if you want to say something to influence the Inspectorate to turn down Thames Water's proposals. 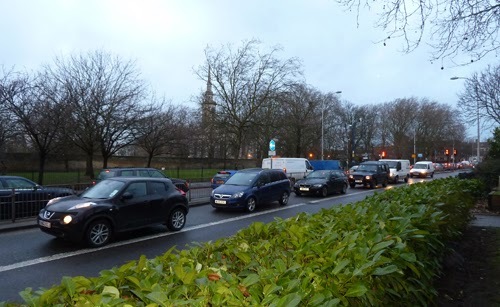 It's not just about saving the green, it's about the three year partial closure of Deptford Church Street that will cause major traffic congestion and doubly increase pollution and noise for all local residents, especially Crossfields. In our recent post about Oscar nominated film director Steve McQueen – who intends to make a BBC drama series focusing on the lives of black people growing up in West London in the 1960s to the present – we wondered if he might also reference South London. 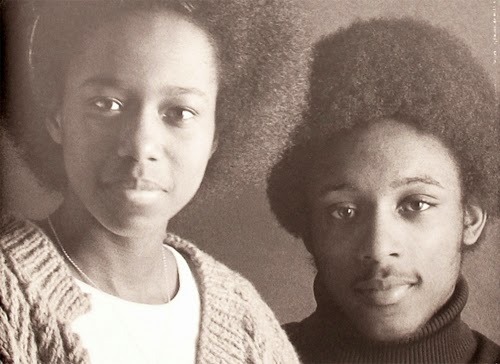 How timely, then, that a new book of beautiful portraits of some of Lewisham's young black people in 1977 has just come out. John Goto's Lovers' Rock features young people from a Lewisham Youth Club, dressed for a night out at the dance hall and looking fab. Goto was teaching photography there – the sitters knew him, so are very relaxed in front of the camera. You can view the portraits on John Goto's website, and buy the book from the publisher's website (Autograph ABP). With texts by Paul Gilroy and others, the book is set in the context of the unique South London reggae scene from the mid 70s (which gave us Lovers Rock), and the violent clashes with the National Front and the police that occurred at that time. There is also a video featuring the photos, set to a soundtrack of Louisa Mark's "Caught You In A Lie" – older readers may recognise themselves or their friends!